Since the earliest days of screening work in public, in concerts with Tiab Guls/Metamorphosis in the early 1980s, through to more current recent work with Tim Howle, public presentation of my work has involved exploration of expanded cinematic practices, installation and multi-projection possibilities. Sometimes this has been in live cinema and concert contexts, in nightclubs, concert halls or conference spaces; sometimes in galleries, site-specific locations, or public spaces; using film, video, computer or slide projection, or a combination of all of these, depending on time, place and project. In addition to engagement in educational activities in my professional capacity as a university lecturer in video and new media production, I have also been involved in live art projects with young people and youth groups too, including work with the Stephen Joseph Theatre’s youth theatre, providing projections for plays; as well as multimedia performance taster workshops for 12 and 14 year old school students at the University of Hull. Collaborations with Create Arts Development Agency, 2001-2004, resulted in a number of public arts and site specific digital projection projects in North Yorkshire exploring digital expanded practices. Project Projection featured digital projections from the beach onto the 40 feet high sea wall, Robin Hood’s Bay, North Yorkshire. 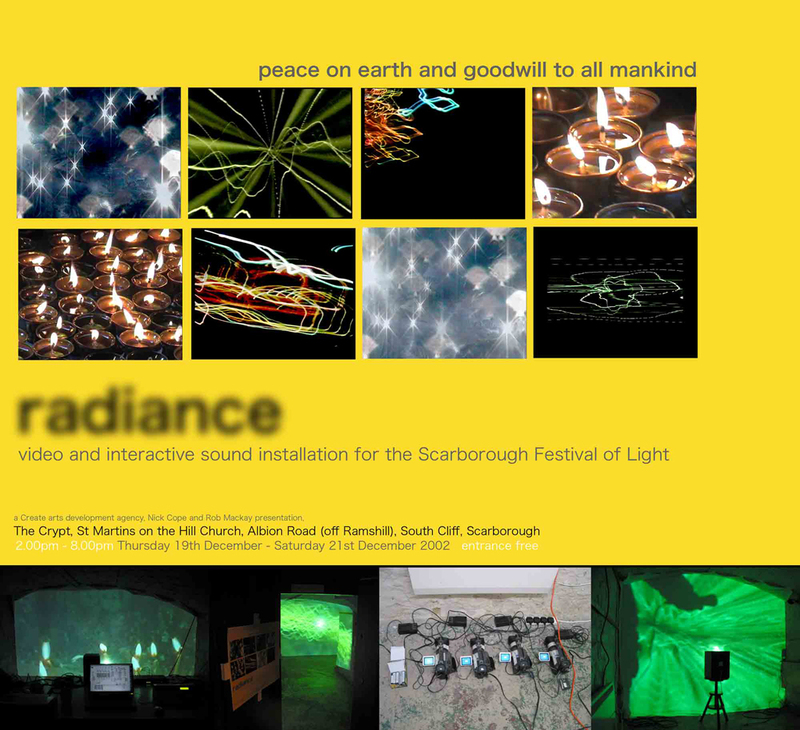 Radiance explored early interactive triggering technologies and sound diffusion in the Crypt of St Martin’s-on-the-Hill, for the Scarborough Festival of Light in 2002. Exploring in an installation/site specific space themes at the heart of the collaboration with Tim Howle, of the encounter of creative moving image practice and electroacoustic composition, on this occasion in collaboration and partnership with composer Rob Mackay. Commissioned for the Scarborough Festival of Light, with funds from Yorkshire Arts and Scarborough Borough Council, Radiance was situated in the Crypt of St Martin’s-on-the-Hill, South Cliff, Scarborough, from the 19th – 21st December 2002. The name of the installation comes from the words of Joseph Campbell: ‘The one radiance shines through all things’, which are used within the soundscape itself. A combination of video projections sought to celebrate and investigate light in its manifest forms, from the distracting and mesmerising light of the city at night, computer graphics and fairgrounds, through the magnificence of light in nature to the meditative presence of the candle flame. The installation was designed as a kind of maze through which the audience moved, encountering these different manifestations of light and being drawn in from the confusing and disorientating lights of urban realms to a more calm and contemplative inner space. The audience is taken on a sonic journey too, from the hustle and bustle of the world outside, through to sounds of nature, and eventually into the last, more reflective space in which quotes from Joseph Campbell can be heard alongside Western sounds of choir and organ with Eastern chants of Tibetan monks and prayer bells. This space contained a stereo soundscape which positioned the sounds of the organ and choir on the West and the sounds of the Tibetan monks chants and prayer bells on the East. These two sides were linked by similarities in pitch and texture to create a unified whole. Rob MacKay used the natural acoustic properties of the space to produce a gradually evolving soundscape. With the use of interactive controllers (soundbeams and touch sensor), the audience themselves interacted with the environment as they passed through, to add another layer to the evolving soundscape (see also the Create website). This video seeks to recreate the experience of the audience moving through the space by intercutting footage documenting the installation and the space, with the actual projections used in the installation to the accompaniment of a walk through recording made in the actual installation of the soundscape created by Rob MacKay, and becomes a self-standing video work in its own right, both documenting the original installation and taking its own audience on a journey into the themes texts and experience of the original installation. Earlier the same year I was invited to contribute a video projection installation in the bay windows of the George Hotel, Scarborough, to accompany the Public Arts funded People Making Places project to accompany the environmental sculpture installation Incline by artist Trudi Entwistle, St Nicholas Street, Scarborough, September 2002. 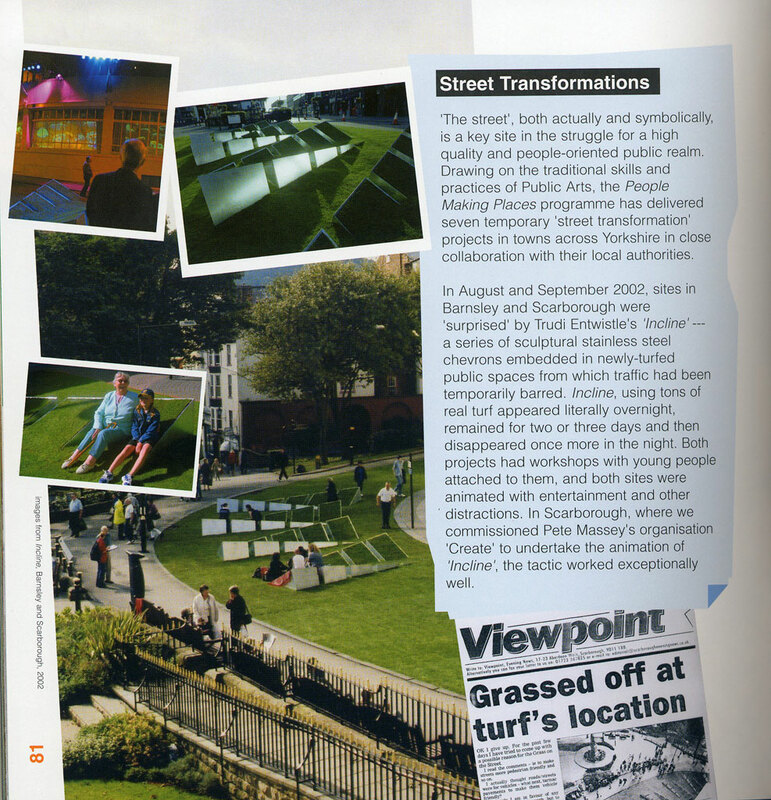 Incline was a substantial site-specific project which featured the grassing over of a section of city-centre street for several days, in a transformation of the public space, to co-incide with the hosting of an international urban regeneration conference in the town. The transformed space hosted live music and performance during the day-time and digital projections and an outdoor cinema in the evenings. 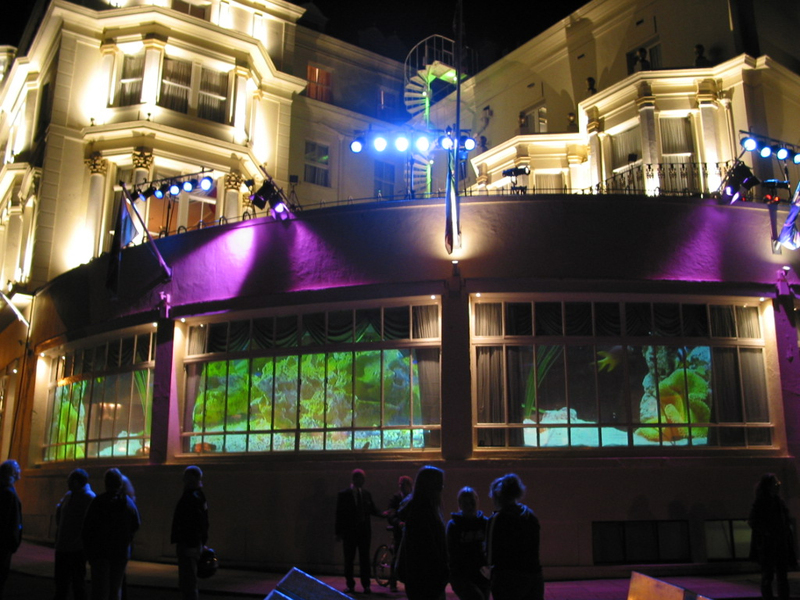 The vast bay window of the George Hotel became a huge aquarium by way of three video projectors screening footage shot at the local Sea Life centre of seahorses and tropical fish. Project Projection, in December 2003, featured projections onto the 20m high sea wall from the beach of picturesque fishing village Robin Hoods Bay, North Yorkshire; a co-production between Create, video artist Cath Whippey, and myself. This followed projection projects in previous years in Scarborough town centre for the annual Festival of Light, including the Digital Store and the Digital Theatre – illuminating an unused shopfront, and the iconic local theatre with video projections. During this time I also worked in partnership, both personally and in my professional capacity at the University of Hull, with Create to facilitate, support and co-produce a host of public arts and digital projection projects including the first outdoor Environmental Film Festival in England, various outdoor cinema events, multimedia club nights, artists installations and shows by VJ pioneers Hexstatic, and the Peace Home music festival. Radiance – 15 minute video/DVD documenting the interactive installation of the same name: Installation – ‘Let There be Light – Strata and Lux’, Coastival 2013: A Different View, Spa Regency Room, The Spa, Scarborough, UK, February 2013. Fabricata Illuminata: Potlach – video, 8’54”(1986). Installation – featured in ‘I Can do That’ – Western Bank Library Exhibition Gallery, University of Sheffield, September – December 2013. Miles Away – Video/DVD 6’19”, 2009, Installation: Featured in video installation/screening as part of the exhibition ‘A Global Gathering’, Bexhill Museum, East Sussex, June-September 2012. Flags – Video/DVD in collaboration with Composer Tim Howle, November 2011, 5’09”. Screening/installation: The Engine Room Exhibition: New Sound and Visual Art Works, (A celebration of the life, works and legacy of Cornelius Cardew) Morley Gallery, London, November – December 2011. Suffer Bomb Disease – ScratchVideo – soundtrack: This Heat, 1985, 4’04” (digital re-master 2007).Screenings:as part of ‘Scratch’, projected installation, Streetlevel Gallery, Glasgow, March 2009. Groovy, Laidback and Nasty – Dynamix of the Metropolis video edit of material originally produced to accompany the live music of Cabaret Voltaire, 1990/96. Screenings: 35 Years of Breaking Boundaries, Tvornica Kulture (Culture Factory), Zagreb Croatia, August 2008. Peace Home Park – Digital Projections – Outdoor Music Festival, Scarborough, September 2005. Project Projection – Public Art Installation in collaboration with Create Arts Development Agency and Video Artist Cath Whippey. An evening of outdoor projections from the beach onto the 20m high sea wall of picturesque North Yorkshire fishing village, Robin Hood’s Bay, December 2003. Incline: Digital Video Projections Installation; Video projection installation in the bay windows of the George Hotel, Scarborough, to accompany the Public Arts funded People Making Places project with environmental sculpture installation by artist Trudi Entwistle, St Nicholas Street, Scarborough, September 2002. The Digital Theatre Digital Video Projections Installation; Video projections in the main windows of the Stephen Joseph Theatre for the Scarborough Festival of Light, Christmas 2002. Radiance Digital Video and Interactive Sound Installation Installation; An immersive environment of video projections and interactive sound produced for the Scarborough Festival of Light, The Crypt, St Martin’s on the Hill Church, Scarborough, in collaboration with composer Rob Mackay. The Digital Store Digital Video Projections/Installation: Video projections in town centre shop windows for the Scarborough Festival of Light, Christmas 2001.